I don't think I've ever been so excited to see spring veggies at the store. Surely it must mean that spring will really come and stay for a while. This winter has been a rough one for many reasons. 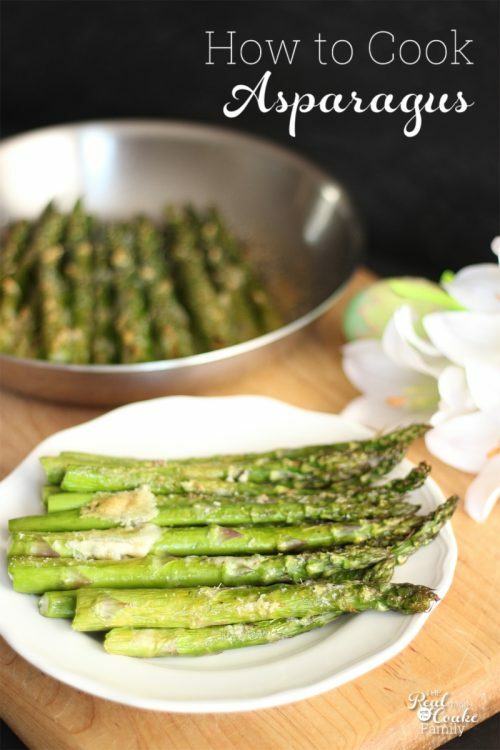 I'm super excited to show you this lovely spring dish as well as show you how to cook asparagus. Until a few years ago, when we first got a CSA food share, I didn't really love asparagus. It seemed that most of the time when I ate it, it was rather mushy and bland. When we signed up for the CSA, I was forced to make lots of things with veggies that weren't always my favorites. The great thing about that is that I learned how to cook a bunch of them and cook them well, so they tasted absolutely delish! In my opinion, cooking asparagus can go wrong really quickly because you don't want it to be too al dente but you also don't want it to be mushy. I've worked up a recipe for perfectly cooked and totally delicious asparagus. Want some? Well come on…let's get cooking. pans for our anniversary gift to each other. They were pricey but so worth the cost. They cook so well and because we bought the stainless steel set, they have no coatings or chemicals. Works for me. They are also oven proof. I've got the full recipe for you at the bottom of this post, but you will start by melting butter in your oven proof pan. By the way, when you prepare the asparagus, just snap it to get rid of the woody end. The woody end won't be as tasty or cook as well. Wherever the asparagus naturally snaps is the perfect point to cook the top half and compost the bottom half. 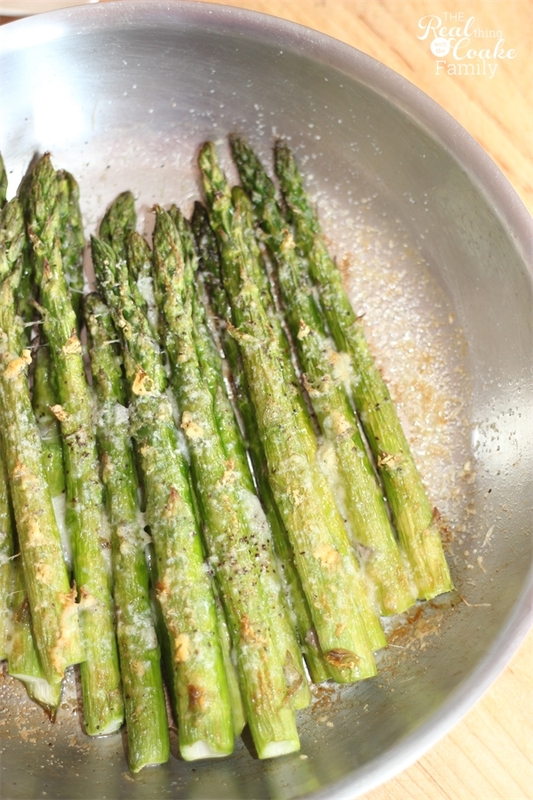 After sauteing the asparagus, sprinkle with your grated Parmesan cheese as well as salt and pepper to taste. Then you will bake it in the oven and finally broil it. It is all so quick and easy. Done and ready to serve! Let me tell you it is so delicious! The asparagus should have just a twinge of crispness to it. When added with the butter, Parmesan, salt and pepper…oh my . It totally enhances the natural deliciousness of the asparagus. I promise you won't be disappointed. Perfect side dish to go with any spring meal or Easter meal you have planned. Maybe with some roast chicken or honey glazed ham, delicious bread and my olive oil and herb dip. Yum! I'm getting hungry. What is your favorite spring veggie? Any tips for cooking it? Do tell…I'd love to learn other ideas for cooking spring veggies and I'm sure my other readers would as well. Leave a comment below. This is such a simple recipe, but oh so good. 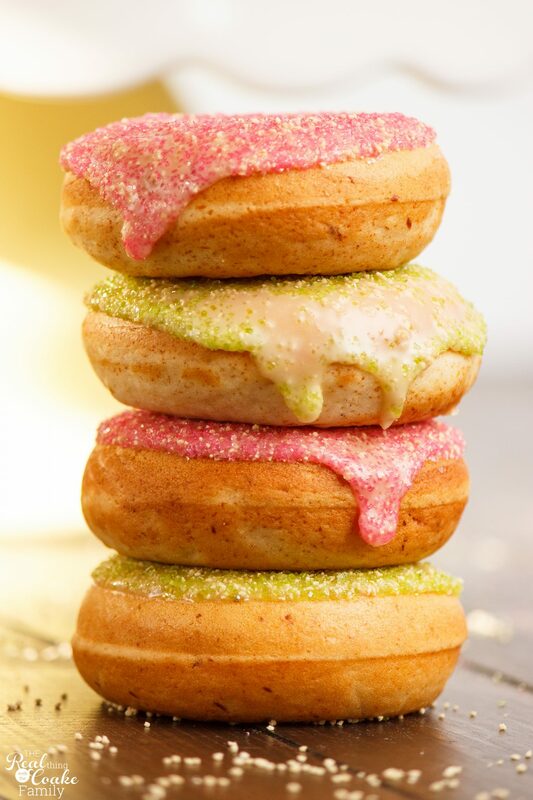 It is just that…simple and super yummy! Enjoy! If you do not have an oven proof pan, what would be a good alternative, and would that change the recipe times? Thanks! I’m glad you asked! Here’s how I’ve done it in the past. Put the butter in an oven safe dish. Cook the asparagus at 425 degrees for 5 minutes(make sure the oven is fully preheated). The add the Parmesan cheese, salt and pepper and cook under the broiler for 2 minutes. Comes out just as good (and is even slightly easier than the other version)! Thanks, KC! I actually made asparagus last night and it came out soo good! I used a pyrex baking dish and your cooking instructions worked nicely 🙂 I also added sea salt and a dash of garlic powder. Take care! I’m so glad it turned out great for you! I love the idea of using sea salt and a little bit of garlic powder. Yummy additions! This is great and another version. Boil in water for about 5 minutes. Run under cold water immediately. Toss with garlic salt and sprinkle with parmesean. Great as a side or appetizers. I am actually eating asparagus right now!! Weird!!! I usually make mine on the stove top w/ the parm cheese….have never tried finishing in the oven! I will try that next time! 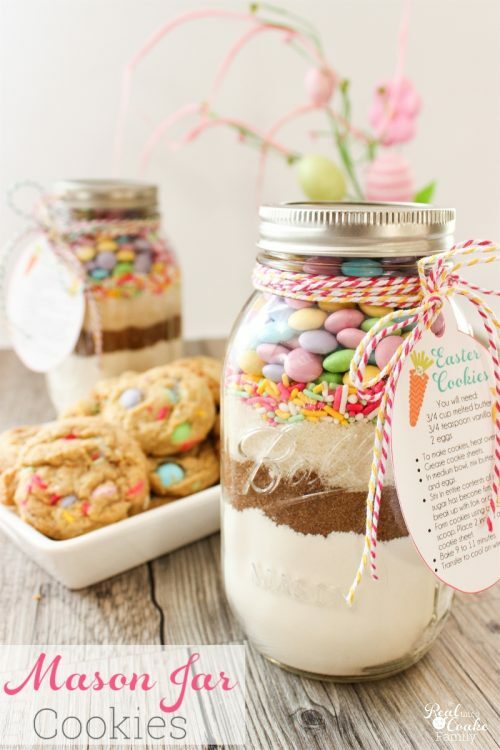 Thanks for sharing, I am definitely adding this to my Easter menu! I Love asparagus and this just looks amazing 🙂 I would love for you to share this on my Friday T.G.I.F. linky party 🙂 Have a great weekend!! My dad loves to eat asparagus. It’s pretty much a side dish to anything we eat haha! We always just cook it on stove top with the same ingredients as you(simple is best! ), but now I’m curious to see how finishing it in the oven will turn out. Thanks for sharing! I would love to hear how you like this in comparison with what you normally make, since they are so similar. Hope you love it if you give it a try. I love how you cooked it in the oven and can’t wait to try this recipe! 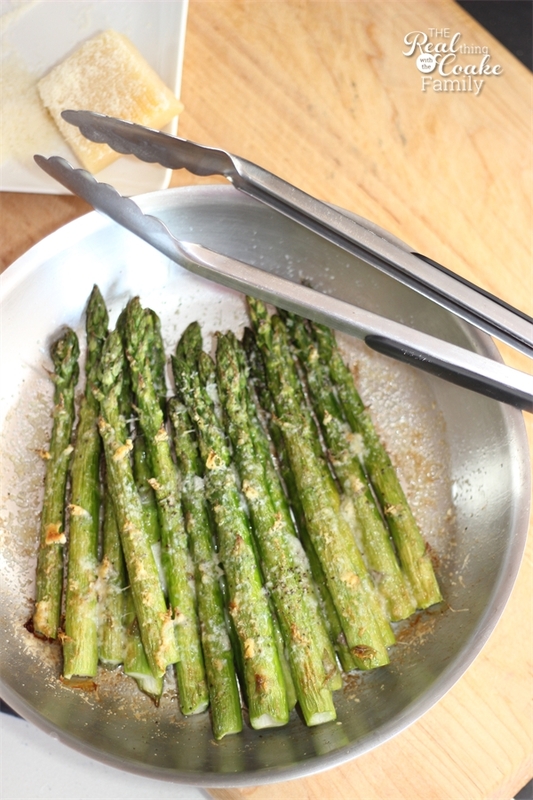 Love, love, LOVE asparagus! Thanks for sharing at Over the Moon. We look forward to seeing you again next wee. I love asparagus! Thanks for sharing on the What’s for Dinner Link up!